Why is it that some people seem to get twice as much done as others – even though they both have the same amount of time in which to do those things? The answer is highly productive people do eight simple things that allows them to reach their deadlines without fail, despite juggling multiple projects. “Time” as Thomas Edison once said “is really the only capital that any human being has, and the only thing he can’t afford to lose." This precious resource must be managed if you want to get more done. 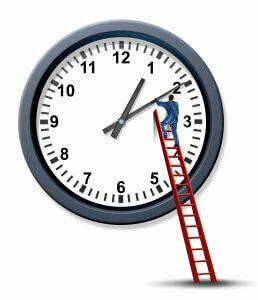 But time management is not about pushing yourself harder or working longer hours – it is about working smarter. Good time management has many benefits – but the one that is often overlooked is the feeling of personal satisfaction you get when you have had a really productive day. By adopting 8 simple things on a daily basis, you too can become more productive. 1. Fight the Tyranny of the Urgent. When thinking about the priority of a task or activity, something can be urgent but not important. These things make us feel as if we have to do them first. They often have little impact but they tyrannise us and get in the way of doing what really matters. Good time managers are good at identifying when responding to something that is urgent but not important is getting in the way of their performance. They are also willing to either ignore the urgent task or to delegate it so that it does not get in the way of real forward momentum. Do you find yourself partially doing something then putting it to one side to “pick up later”? For example, reading then saving an email to reply to later. If the answer is yes, then you are handling that email twice – and this wastes time. As soon as something gets your attention you should either act on it, delegate it, or delete it. Handle things once! Tasks which you dislike or dread are easy to put off. But this approach lowers your productivity. Good time managers know they must resist this procrastination tendency so tackle these tasks first. This frees up their time and mind so they are able to tackle the things that excite and inspire them. Trying to do two things in the same time frame (multitasking) is a real productivity killer. Researchers at Stanford University found that people who were bombarded with several streams of electronic information were not able to pay attention, recall information or switch from one job to another as well as those who completed one task at a time. The researchers also showed that people who regularly multitask because they felt that it boosted their performance were actually worse at multitasking than those whose work style was to do a single thing at a time. The regular multi-taskers performed worse because they took longer to organise their thoughts and filter out irrelevant information and were also significantly slower at switching from one task to another. So do one thing at a time. Good time managers end each working day by getting ready for tomorrow before they leave the office. This habit of reviewing and planning achieves two things: It helps them solidify what they have accomplished today, and it ensures they have a productive tomorrow. This preparation only takes a few minutes, but as Benjimin Franklin said: "For every minute spent organizing, an hour is earned." Badly managed meetings are one of the biggest business time wasters. Good time managers ensure that in any meetings they hold they stick to the agenda. They also communicate to others at the start of every meeting that this is their intention – so setting limits that motivates everyone in the meeting to be more focused and efficient. "No" is a powerful word that you should not be afraid to use in order to improve your productivity. Saying no ensures you can achieve your existing commitments. Research conducted at the University of California in San Francisco showed that people who had difficulty saying no experienced more stress, burnout and even depression. When you need to say no avoid vague phrases such as “I don’t think I can” or “I’m not certain”. Learn to use no directly and assertively – this will lift your mood and your productivity. 8. Do Not Allow Email to Interrupt You. Email alerts that inform you every time an email arrives in your inbox can be a constant distraction. It can waste a significant amount of your time. Only check your email at designated times. Set up an autoresponder that lets people know when you will be checking your e-mail again. If you really do need to respond instantly to certain customers or colleagues, then it’s also a good idea to set up the features in your email that allow you to prioritise messages by the sender and set up alerts for your most important contacts. In this way you can deal promptly with emails that require your immediate response and they save the rest until you reach a stopping point. These 8 habits will help you to be more productive. Another good way to improve your productivity is to attend our time management masterclass or to take our online time management training course.